Large baking sheet / oven tray. Preheat oven to 180 °C (350-360 °F), with fan. I use a large, very sturdy fork. Kneading by hand also works fine. Make sure to get all the flour that will be trapped underneath the dough ball. Lightly oil a large baking sheet or oven tray with some olive oil on a wad of paper towel. Grab about 2 rounded tablespoons of dough, press into a ball with the palms of your hands, then briefly roll between your palms to begin to shape them into a bar. 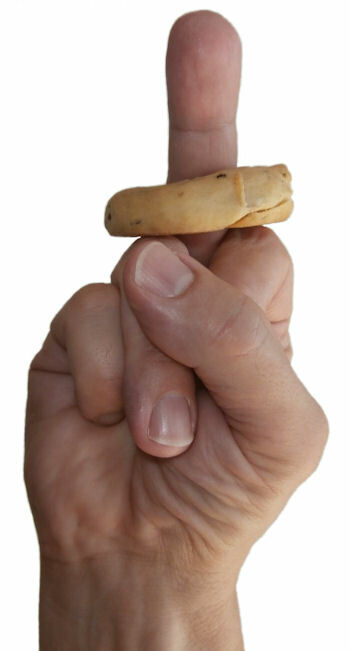 This is about 40 grams (1.5 oz); adjust as necessary to get the size of grissini that you like. On a clean, smooth kitchen counter, with both hands parallel, roll the bar back & forth with the palms of your hands until the desired thickness and length is obtained. I make them about 1½ cm (½ inch) thick and 15-20 cm (6-8 inch) long. Place on the oven tray. Repeat until all dough is used up. 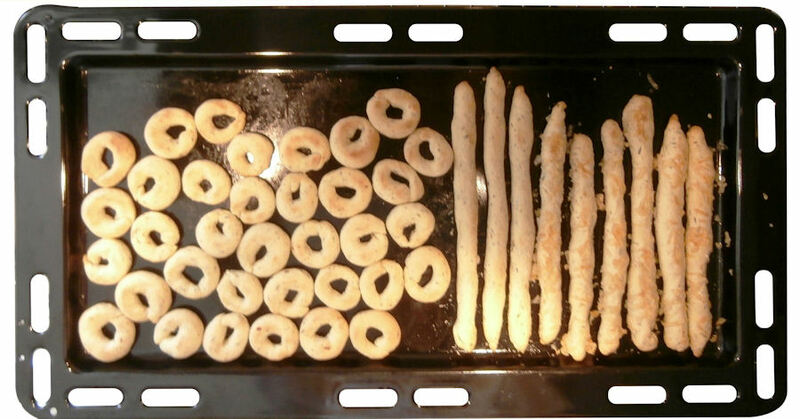 Roll into a thin bar as described above for the grissini, but use only 1 rounded tablespoons of dough. Take the ends of each bar and push one on top of the other, to form a ring of the size that you want. 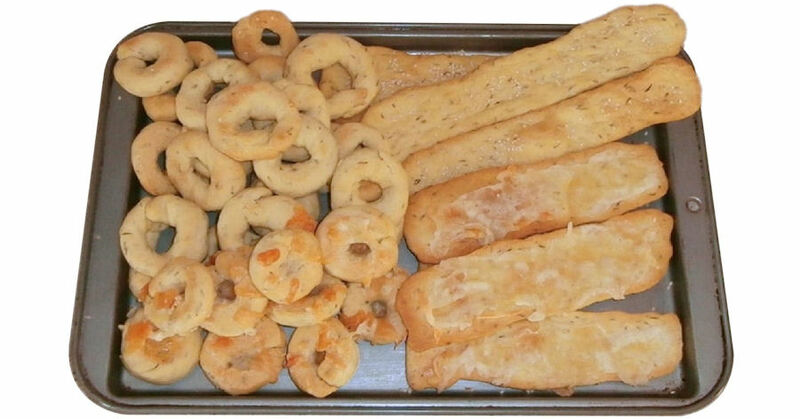 When the top of the dough rings/sticks is dry (takes about 15 minutes), and the bottom of the rings/sticks begins to take color, turn them over. At this point, they are still soft when you press them! Optional: push the tarrali and/or grissini together and cover generously with the grated cheese. Bake for another 15 minutes (until light golden and no longer soft when you push down on them; they should not be bone dry!). If you covered them with cheese, you will have to bake them about 10 min longer; the cheese prevents moisture to escape from the top of the dough, and the cheese also releases grease while melting. Perfect for dunking in white wine!